(2018) What's in my bag? A lot has changed since I did my "What's in my bag?" last year. I've completely converted to a full frame mirrorless system with native trinity zooms. As some of you know, I was using a Metabones Speedbooster to adapt my Canon glass to my Sony camera. The adapter was great because it helped me transition from Canon to Sony. One of the cons of using adapted glass is that lenses tend to focus hunt a lot. This made it difficult to shoot at times which pushed me to purchase native glass. Disclaimer: This isn't necessarily the setup I would bring with me when I travel overseas, but more for a full day production shoot. Filling you bag with a bunch of metal and glass can get heavy! If you're interested in seeing my travel setup let me know on Instagram! VIDEO: For any gimbal work, the Zhiyun Crane Plus can comfortably support my A7III and 16-35mm F2.8. This Crane Plus (2.5 KG) supports a heavier payload than the original Crane (1.8 KG). But if you're looking for a more studier rig check out the Zhiyun Crane 2 or DJI's Ronin-S. And if I'm shooting handheld without a gimbal, I use my Peak Design Leash as a stabilizer. TIME LAPSE: I use an external intervalometer because Sony has decided to remove the Play Memories App (which has a built in time lapse feature) from their newest line of cameras. The Oben tripod I have is lightweight and compact which is perfect for travel. AERIAL: I'm still waiting for the Mavic Pro 2 to come out (hopefully this year), but currently using the first Mavic Pro. This drone is small enough to fit in my gear bag which makes it a no-brainer to pack every time. And if I'm filming midday or need any long exposure shots I'll attach a Polar Pro filter onto the lens so I can shoot at the proper shutter speed. AUDIO: One of my favorite additions to this setup is my new shotgun mic. The Rode VideoMic Pro+ is a little bigger than the previous model, but charges via micro USB, and has an automatic function where it turns on and off when the camera is plugged in. STORAGE: The Samsung T5 SSD is one of the best drives I've had in years. I used Lacie's Rugged drives for years, but one of the downsides is that they're still HDDs. Lacie drives are great value for their price, but if you want fast reliable external storage I'd recommend using a Samsung T5 SSD. (2017) What's in my bag? 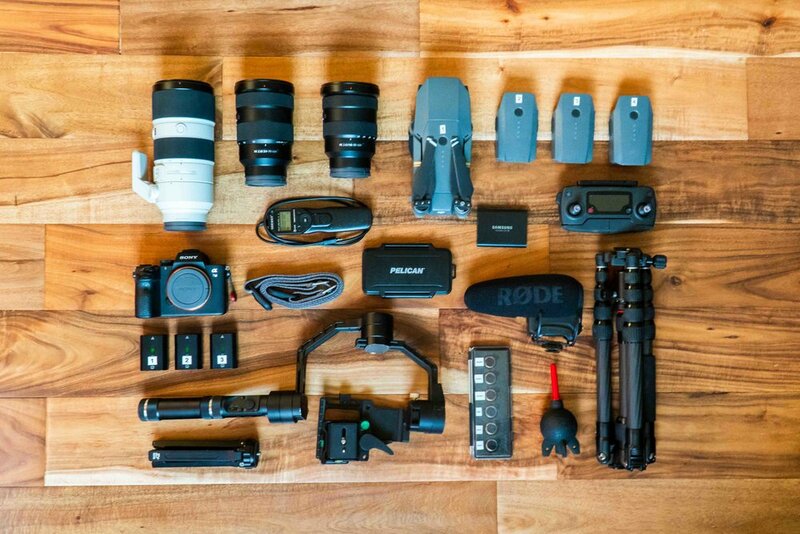 Take a closer look at what I carry with me while I'm out traveling. Why I switched from Canon to Sony! A story about my journey with photography gear, how I came to a decision about switching, and what I'm currently shooting with today. Join along on my adventures as I travel the world and share beautiful images!